Under the Spanish Stars is the story about two strong women: Charlotte, a twenty-seven-year-old who is struggling to discover what future she wants for herself; and Katarina, Charlotte’s ninety-six-year-old grandmother, who has a health scare that leads her to dissect a painful past she’s tried to forget. Charlotte travels to Granada to uncover the mystery behind her grandmother’s painting and enlists the help of the charming Mateo Vives, a flamenco guitar player who has a special and mysterious connection to a gypsy clan. Charlotte is drawn into their world, fascinated by their ancient culture and is inspired to explore her dreams and desires. Mateo and Charlotte grow closer—until she discovers his complicated history that directly affects her family. Will the obstacles prove too difficult for their relationship to survive? As Charlotte pieces together Katarina’s life in Spain, she uncovers decades of lies and betrayal. Charlotte delves deeper into her grandmother’s past and she discovers parallels in her own life, including a fear of following her heart. Will Charlotte repeat the same mistakes as her grandmother, or will she find a way to make peace with the past and create a future where she can be true to herself? Set against the backdrop of beautiful and historic Granada in southern Spain, Under The Spanish Stars combines the stories of Charlotte’s hopeful future with Katarina’s turbulent past in 1940s Spain. As their worlds collide, both women are forced to question the true meaning of heritage, family, and love. Under The Spanish Stars will appeal to readers who enjoy stories set in foreign destinations, romance, and adventure with a twist of mystery. I’ve always been fascinated with history and when I discovered my family’s connection to the Spanish Armada, the idea for a multi-generational saga that involved family secrets grabbed me and wouldn’t let go. Southern Spain is such a beautiful part of the world and as it is home to a melting pot of nationalities over the centuries, I couldn’t resist the setting that is rich in culture, magnificent architecture and enchanting mysteries. That it’s diverse and no matter what you’re in the mood to read, there’s a story out there that will suit. 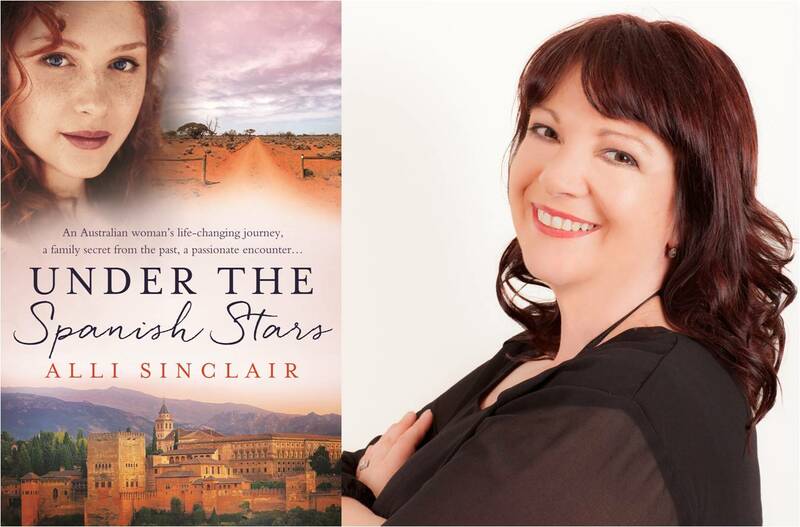 Under the Spanish Stars is released in Australia and New Zealand and readers throughout the rest of the world will see the release of Midnight Serenade (known as Luna Tango in Aus/NZ) in July. It will be a year full of events, give-aways and competitions so if you’re interested in keeping up to date with the latest, pop over to www.allisinclair.com to follow the blog or sign up for my newsletter. I’ll be completing two new books and look forward to sharing details with readers throughout next year. I was voted Favourite New Romance Author by members of the Australian Romance Readers of Association and Luna Tango won cover of the year as voted by members of Romance Writers of Australia. My prequel to Under the Spanish Stars, called Dreaming of Spain, was released as an eBook late December so if you’d like to get a taste of the story, you can download it for free. I sold three books to Kensington Publishing and had the first short story I’ve written since high school (which was a loooooong time ago!) published in the Harper Collins anthology Hot Stuff: Surfing Love (http://www.harpercollins.com.au/9781460706527/hot-stuff-surfing-love). Charlotte Kavanagh’s beloved grandma Katarina Sanchez is gravely ill, so when she begs Charlotte to travel to her homeland in Andalucía to uncover the truth behind a mysterious painting, Charlotte agrees. Taking leave from her soul-destroying job and stalled life in Australia, Charlotte embarks on a quest through Granada’s ancient cobble-stoned streets and vibrant neighbourhoods. There she meets Mateo Vives, a flamenco guitarist with a dark past, and quickly becomes entangled in the world of flamenco and gypsies that ignites a passion she had thought lost. But the mystery surrounding the painting deepens, reaching back in time to the war-torn Spain of the 1940s and Charlotte discovers her grandmother’s connection to the Spanish underground. Who is her grandmother, really? What is Mateo’s connection to her family history? And why is finding answers to a family mystery turning into a journey of self-discovery for Charlotte? Weighed down by secrets, betrayals and shattered relationships, Charlotte finds herself questioning the true meaning of heritage, family and love.